These fudgy strawberry cheesecake brownies are made healthier with 100% whole grains and Greek yogurt! When Jessica posted these skinny fudgy brownies the other day, I knew I had to make them. But I wanted a strawberry cheesecake topping to jazz them up for Valentine’s Day. I did some googling and had to giggle when Jessica’s strawberry cheesecake brownies popped up in the results. I thought it’d be a good move to combine the two. And this was a very, very good idea. They’re not gooey like I normally prefer my brownies, but fudgy is good. And fudgy with cheesecake topping is more than acceptable! They were fantastic and I can’t wait to try the brownies with different fillings and toppings. A half cup of Greek yogurt replaces all the fat (okay, I’m not counting the tiny bit in the egg, flour, etc.) in the brownies and there’s another whole cup in the cheesecake topping. We only have 10% fat “Greek style” yogurt over here, which makes me want to cry, but for those of you in North America, this results in a pretty darn low fat brownie! You can use any type of jam or fruit sauce on top. On one half, I used some leftover-from-the-summer strawberry jam I fished out from the fridge. And while I was rooting around in there, I found some of my strawberry sauce. Yay! I’m no good at marbling, swirling, whatever it is, so I just covered one side with the sauce. And I think I preferred it that way. More strawberry sauce is always good! The only downside is that it’s not as pretty. But then I ate it. Muahaha. I decided that only I should be receiving chocolate hearts from him and… he refused to take it. 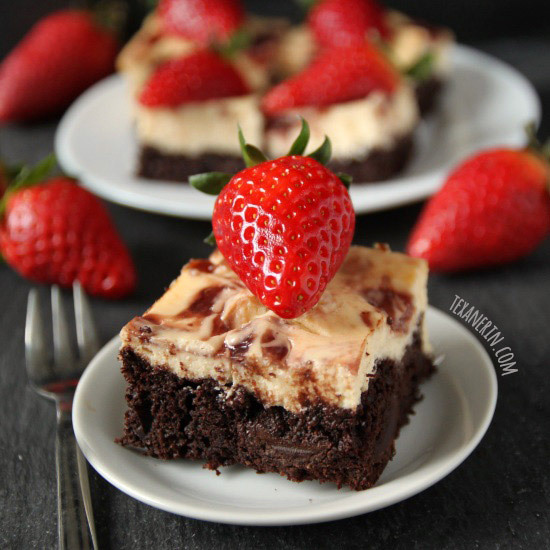 More strawberry cheesecake brownies for me. Preheat your oven to 350°F / 175°C. Line an 8x8in pan with parchment paper or spray lightly with cooking spray. To make the cheesecake topping, beat together the cream cheese, eggs, and sugar until creamy. Beat in the the vanilla and then slowly add in the Greek yogurt. Set this aside. In a large bowl, whisk together the dry ingredients. In a small bowl, whisk together the wet ingredients. Add the wet ingredients to the dry and mix just until combined. Do not over mix! Spread the batter evenly into the pan and then pour on the cheesecake batter. Try to distribute it evenly. You can either completely cover the cheesecake filling with strawberry sauce or jam, or you can cover the cheesecake with teaspoons of jam, leaving about a centimeter between each jam-blob, and then use a knife to create swirls. Bake for 20 minutes. Lower the heat to 325°F / 162°C and bake for another 20 minutes. Remove from the oven and let cool before cutting. Store covered in the refrigerator for up to 5 days. If you live in Europe, you probably don't have bricks of cream cheese like in the US. If you only have the spreadable type meant for toast, drain the content of a 300 gram container with a cheesecloth or a kitchen towel until it's thicker, like the consistency of the American stuff. Just wring it out. It should be 225 grams when you're done. 73 comments on “100% Whole Grain Strawberry Cheesecake Brownies” — Add one! so, initially I thought I screwed up the recipe as I mixed all cream ingredients together from the beginning!. So the batter was quite runny. I let it cool a bit in the fridge, preparing your strawberry sauce. finally It came out ok! Creamed baked nicely! May I ask if you could update the recipe giving us also gr for cocoa powder and yogurt. do you know how I rework the baking times if I use mini muffin size pans? thank you! I haven’t tried it so I’m not really sure. I’m guessing about 12-16 minutes? I hope you’ll enjoy them if you give it a try. :) And my apologies for the slow reply! I just got back from vacation and wasn’t able to access the page from my laptop where I approve and reply to comments. Sorry about that! For the brownies, does the flour need to be WHITE whole wheat, or does regular whole wheat work? I know sometimes that yields a breadier, denser taste, but I was hoping regular whole wheat would work! Could I add the pure cane coconut sugar in the Cheesecake topping batter instead of regular sugar? Do you think that would really alter the taste. Hi, Michelle! I’ve never heard of pure cane coconut sugar. I’ve heard of pure cane sugar, which would be fine, but I think coconut sugar would make the topping a little too molasses-y tasting. If you don’t mind the darker taste, it’d work, too. I hope you’ll enjoy them! Hi :), this looks heavenly!! Do you think I could make this using your grain free date-sweetened brownies as the brownie base instead (https://www.texanerin.com/2013/10/grain-free-fudge-brownies.html)? Is it possible to use a box mix of brownies? & do the rest as it says. I haven’t tried it but I’m assuming that’d work. :) The baking time will likely be very different so you’ll just have to watch them. If you want to make this into a 9×13 pan would you double the cheesecake recipe? Yes, I’d double everything. :) Hope you’ll enjoy them! Made these. They were GREAT! For the topping I just mashed strawberries and added it after they were baked. I noticed though I had to cook mine a lot longer in the second half, about 40 minutes instead of 20. But at the lower temp the brownies didn’t burn or over bake. It all turned out GREAT!! Love your recipe!!! Thanks you! How are these supposed to look when done? I baked it for the said amount of time, but they’re still so jiggly. will they harden as they cool or should I put the brownies back in for longer? they look and smell divine already, I can’t wait to taste. Also, I made mine dairy free using coconut greek yogurt,daiya cream cheese, and almond milk. you believe I can do it in cupcakes? I’ve read the instructions but what I don’t understand is do you bake them seperatly or together? Could you use cherry pie filling on the top instead? My kids don’t like strawberries, but everyone here loves cherries. I was going to make my own jam by just mashing up fresh strawberries. Will they be affected by the heat in the oven ? That should work fine! I also used homemade jam and it was no problem. :) Hope you enjoy the brownies! I made these last night. Turned out absolutely delicious! I made them with a boxed brownie mix, otherwise I flowed the directions to the tee. I would suggest baking them longer as they are not quit done through and through. Still absolutely amazing none the less! Will def make these again. Very easy. Thank you for sharing your recipe! I’m so happy that it worked out for you! A boxed mix certainly cuts down on the preparation. I like that! I’m happy to hear that you enjoyed the brownies and that you’re even going to make them again (that’s like music to my ears ;)) Thanks a bunch for the feedback! I made these with a few alterations. I used my favorite boxed brownie mix as the base. Ghirardelli Doubke Chocolate (I know not the healthy alternative!) , and 2 containers of Fage 2% or 0% 5.3 oz Greek Yogurt with Cherry (or whatever fruit topping you like). I added the two containers of yogurt into the cheese mixture, then used the cherry from the yogurt as the topping. I dropped the fruit topping on by 1/2 teaspoons then swirled with a knife. I also used reduced fat cream cheese. turned out great! Needed to cook longer than stated. I would love one of these with a giant glass of moo juice! 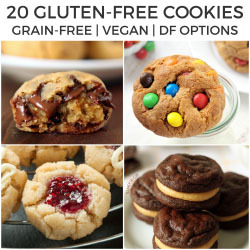 Have you tried to make this recipe gluten free? Moo juice? Hehe. :) I haven’t tried to make this recipe gluten-free but what if you used this as a base for the chocolate part? Moo juice is milk. Hahaha Thank you for this gluten free switch!! I will try it & let you know!! Happy 4th of July from Lubbock!! Bob’s Red Mill has an awesome Gluten Free Brownie Mix, I bake in a 9 X 9 square pan instead of 9 X 13 and they are thick, moist and delicious. Made these at Summer Camp for the GF kids and one of them actually cried tears of joy over them. Great post and photos! Sounds delicious! Wow, do these look amazing or what! 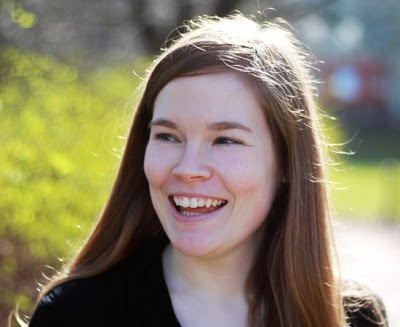 omg i’m super happy when i landed on your blog – this is a wonderful filled with amazing desserts! I’ll have to try out some of the recipes here during the weekend! Erin, do you have any idea what the nutritional info is in comparison to regular brownies? Oh my goodness, these looks so good. And I love that they are whole grain! 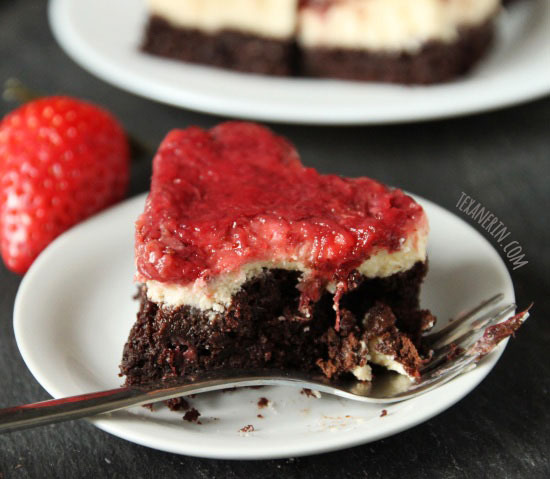 I love the combination of brownie and strawberry cheesecake!! Pretty much genius!! I am ALL over these! Great combination of flavors! They look truly decadent. Okay, these are amazing. That fudgey looking brownie is calling my name!! Yum! This sounds so good. 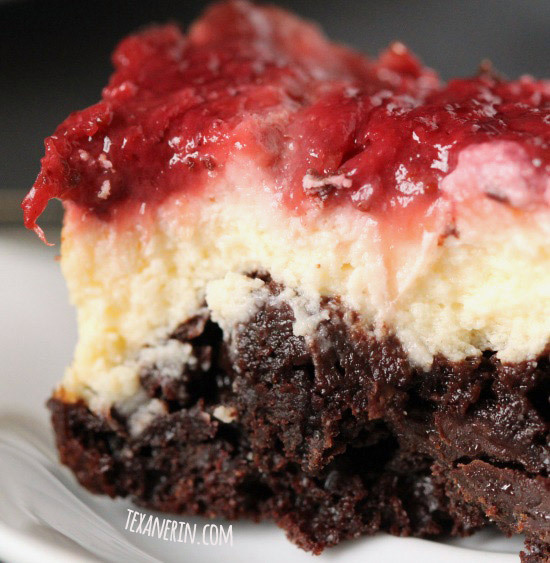 Strawberry, cheesecake, brownie.. all of everything I want in one, plus it's healthy? Amazing. What a wonderful recipe! I LOVE brownies and healthier ones? even better! I'm not a huge fan of cheesecake but my husband is so this is perfect for the both of us ;) I'm saving this recipe! And it's nice to meet another fellow Texan! I live in Austin. If I'm reading this write you actually cook it with the jam on top, right? Also, I don't have any whole wheat do you think unbleached white flour would work? Someone is attacking this post with spam. They have been for the last few hours. I think I've deleted about 20 from the same person. :( So I've changed the settings so that I have to moderate the comments first. I'm about to go to sleep and don't want to wake up to find 141 spammy comments on here. Needless to say this is amazing. I'll be sharing this on my blog tomorrow. 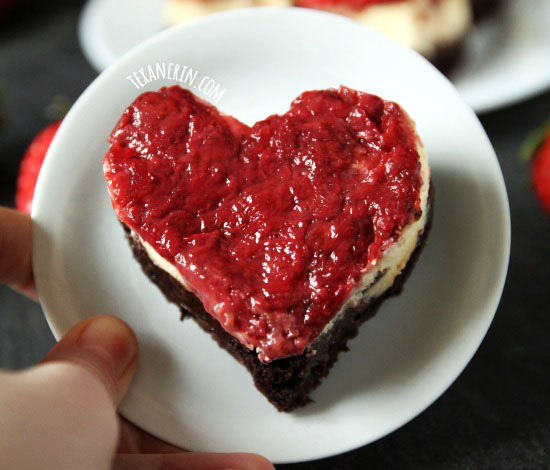 The strawberry sauce looks perfect on top of these and I love the heart shaped brownie! Happy Valentine's Day! Happy Valentine's Day to you, too! :) Thanks again for the recipe! As for me I will be going to my 8am math class, be bored for about 2 hours while I wait for my next class, and then spend three hours in Chemistry Lab and then proceed to freak out over a math quiz I have on Friday in which I have no idea how to do, such a romantic I am, huh? Haha. Oh well. Aww. I didn't know. :( I thought I was doing well to get up a chocolatey + strawberry recipe up! Tomorrow sounds really boring for you. That stinks! I will be at home all day cleaning so it's not that much better, is it? Anyway, happy almost Valentine's Day to you, too! Great idea to combine these, they sound deeelicious! This is a combination of all things delicious! Great recipe!